This article assumes that you have already created a work template. 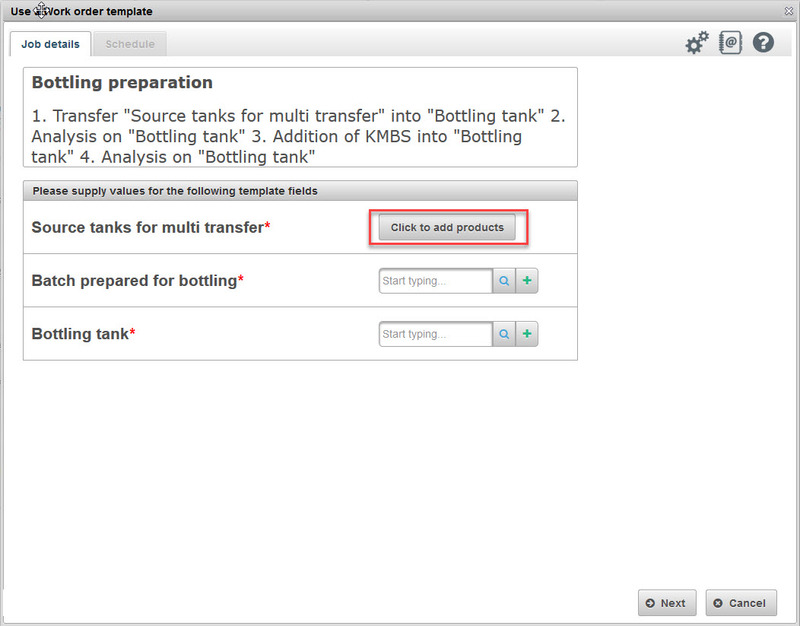 Please refer to this article on Creating work templates. 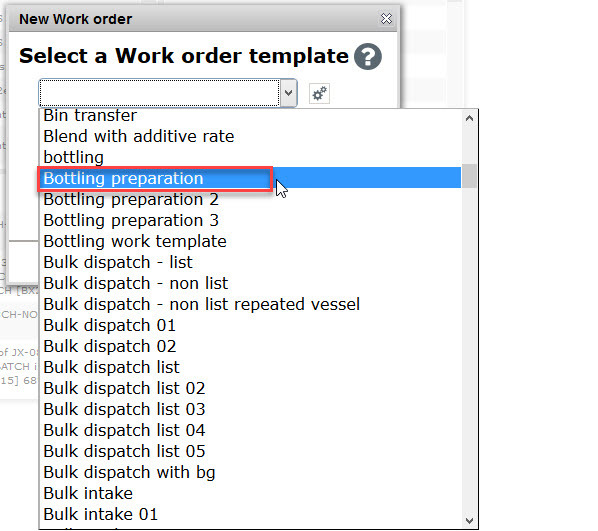 To use this work template click on the create work order icon on the quick launch bar in your vintrace screen. Alternatively, you can also go to File – New work order from template. 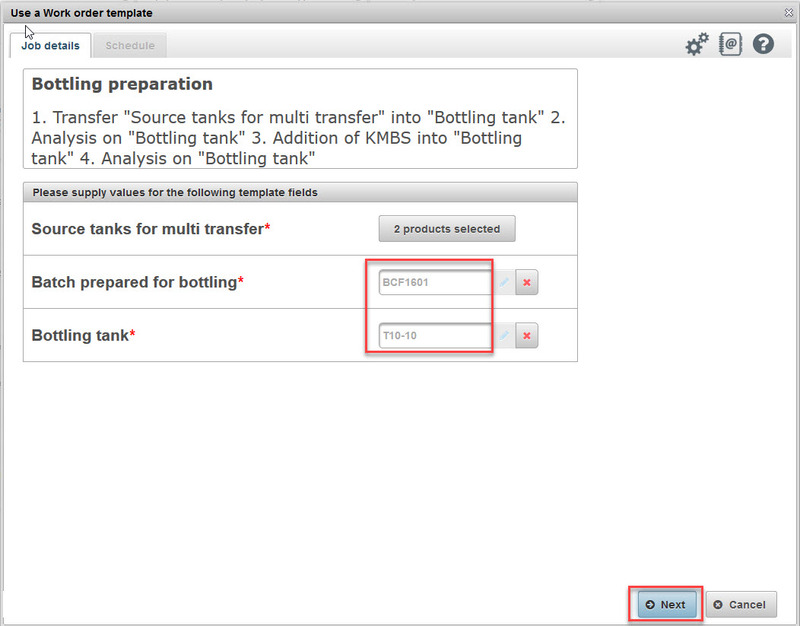 In the New Work order screen, select the template you want to use. This will bring you to the Use a Work order template screen where you will provide values to the fields set in your template. In the Use a Work order template screen, hovering your mouse pointer over the description of each field will show you the original values from the work order. Clicking on the setup icon brings up the Winery Setup screen, clicking on the address book icon brings up the Address Book screen, and clicking on the help icon brings you to the online help article on how to use a work order template. 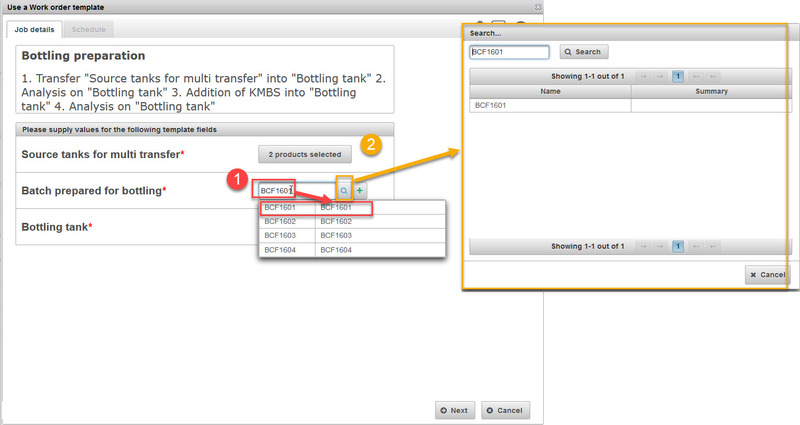 In the example below, the “Source tanks for multi transfer” field requires you to select the vessel/batch from a list of products. This is actually a setting you have selected when you created the work template. Click on Click to add products button. In the Edit List screen, you can either select a list of products by clicking on any of the Saved Search links or you can click on From Search button which will bring up the Product Search screen. Clicking the From Search button will take you to the Bulk wine search. 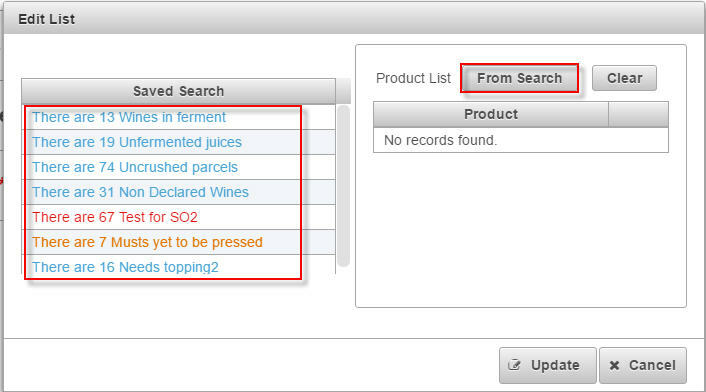 For information on finding one or more bulk wine products, click here. 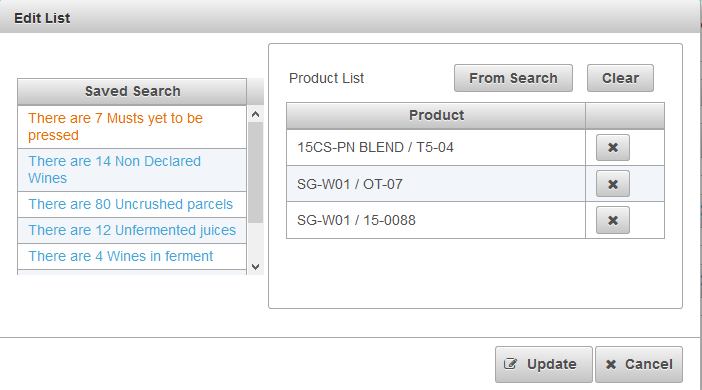 The selected products (as shown above) will be listed in the Edit List screen. Click the Update button to update your list. This will bring you back to the Job details tab. 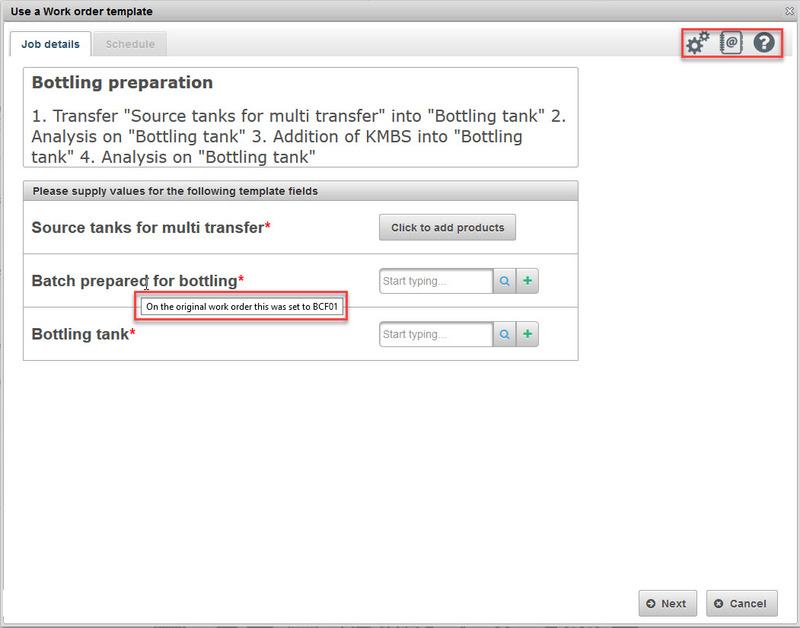 Enter the batch name in the “Batch prepared for bottling” field and a vessel in the “Bottling tank” field. Click on the magnifying glass beside each field to bring up the search screen and select from there. Once you have entered the data in the required fields, click on Next button. This will bring you to the Schedule tab. Start work on – the scheduled date of the work order. This is by default set to start on the current date and time. You have the option to change the date to Complete work by which will set the date you selected as the end date of your tasks. You can click on the calendar icon to bring up the job calendar and select the date from there. Assign it to – the assigned person for the work order. Bond (only in US locale) – the selected bond for the work order. Winery (only for those with multi-winery license) – the selected winery for the work order. Print template – this will only appear when the Printed work order format is MS Word. 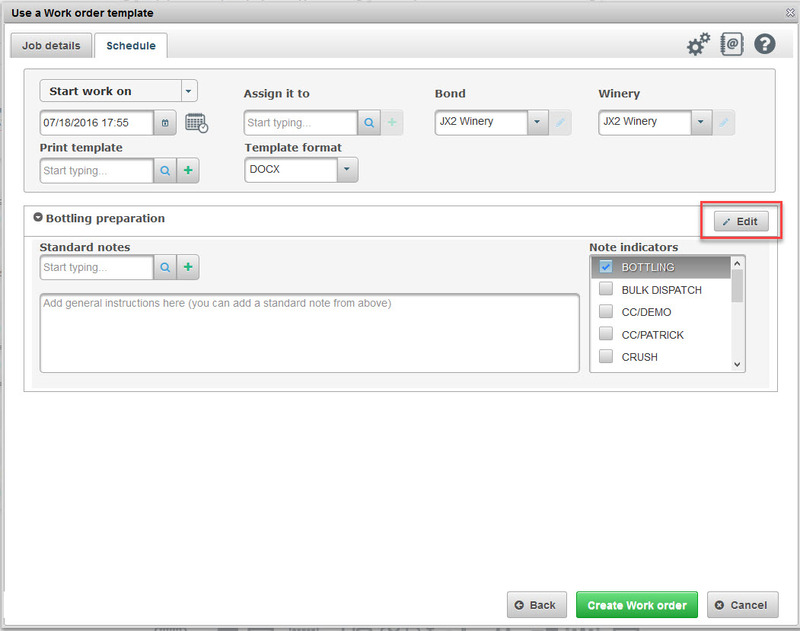 This allows you to select a custom template for the work order. Template format – this will only appear when the Printed work order format is MS Word. This allows you to select either PDF or DOCX format. *For work order templates that will generate multiple work orders, you can add standard notes and note indicators for each work order. You can change the details on your work order by clicking on the Edit button. This will bring up the work order writer screen. 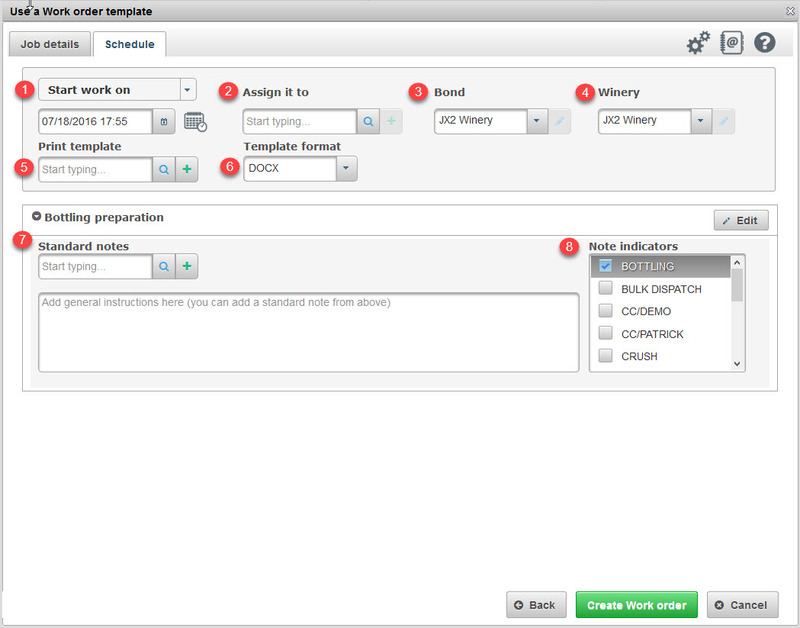 This will allow you to modify the current work order without changing the design of the underlying work order template. When you are satisfied, click on Create Work order button to generate the work order. 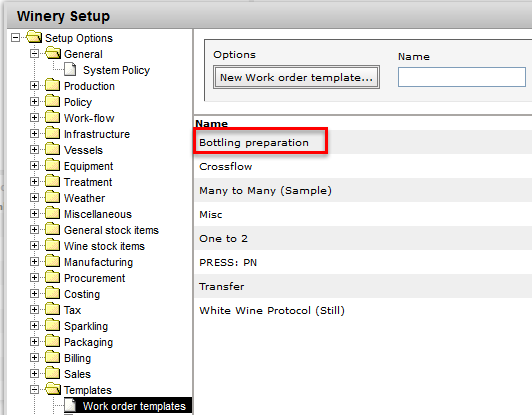 If you want to edit the work order template, head into Winery Setup – Templates – Work order templates. Choose the work order template to be edited. You may edit anything on either the Jobs or the Details tab. Make your edits and when complete, click Save. The next time you use this work order template, you will see the changes you saved. How do I change the date on a completed operation?